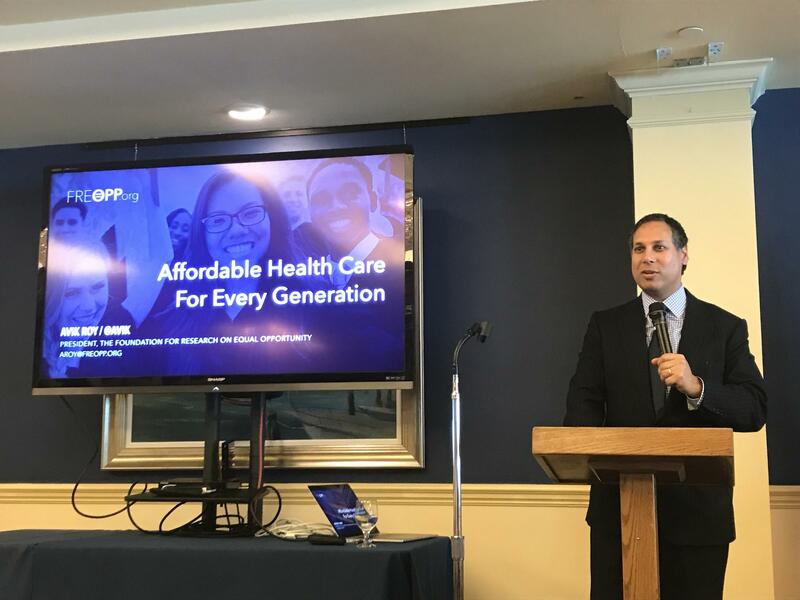 Avik Roy, President of the Foundation for Research on Equal Opportunity, recently presented his plan for universal health care at the Bird Key Yacht Club in Sarasota. Part of Roy's presentation in Sarasota included an attempt to explain how the American health care system got to its current state in one chart. Conservative author and health policy expert Avik Roy has a plan for universal health care. The president of the Foundation for Research on Equal Opportunity recently spoke about health care at the Bird Key Yacht Club in Sarasota. Health News Florida's Stephanie Colombini sat down with him there to talk about his ideas. Listen to HNF's Stephanie Colombini talk with health policy expert Avik Roy about his conservative plan for universal health care. Read a transcript of an extended version of this interview, which has been edited lightly for clarity. Right now a lot of people equate “universal health care” with Medicare For All, or single-payer, but that’s not what you’re proposing. Explain how your ideas are different from that. That’s exactly the right question to ask, because there is this misconception both on the left and the right that if you want to achieve universal coverage, single-payer is the only way to do that. But if you actually look at the other advanced economies that have universal coverage, there’s a plethora of ways to achieve universal coverage. 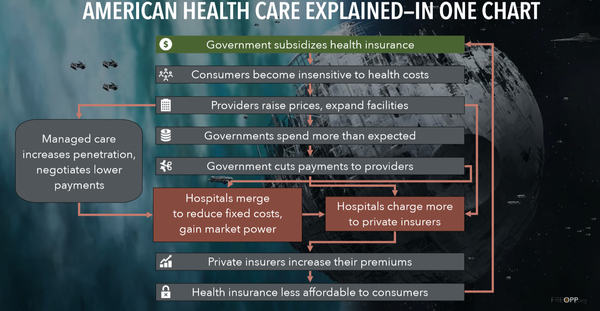 Some do so through single-payer, but many do so through a system that involves private insurers or a hybrid system in which there are public and private insurers. For example, Switzerland and the Netherlands are countries that have entirely private insurance-based systems but they have universal coverage. Germany is an example of a country that has a mix of both public and private insurers. And of course there are countries like the United Kingdom and Canada that have an entirely government-run system. So there’s a whole spectrum out there, and so there are a lot of countries for Americans who want a more private sector-oriented system, a more consumer-driven system, that we can learn from and yet still achieve universal coverage. How can we spend less and cover more people? Think about programs like the Affordable Care Act’s exchanges, or Medicare Advantage or the Medicare Prescription Drug Benefit. Those are all systems in which the taxpayer, the government, is providing financial assistance so that people can afford those insurance products but the actual insurance itself is sponsored by private insurance companies. So that’s basically what Switzerland does. Switzerland has a system that’s like the Affordable Care Act exchanges, but for everybody. In Switzerland there’s no public option. There’s more of a consumer-driven system where everybody has free choice of private insurers, and because those insurers are competing to offer you the lowest premium but for a regulated benefit package, they have an incentive to negotiate those prices of drugs and hospital care down. And it’s a system in which the amount of financial assistance you receive is dependent on your income. So if you’re really poor, you get a full ride, your premium is paid for entirely by the government. And as you go up the income scale, that assistance phases down and if you’re upper income you get no assistance. Unlike the United States where we heavily subsidize health insurance for rich people, for upper income people as well as lower income people – but not all lower income people – in Switzerland, the subsidies and the financial assistance are targeted to vulnerable populations: lower-income people and the sick. You’re ideas involve big changes and they’re not going to happen overnight. What are some realistic first steps? If we want more people to shop for their own insurance and use competition and choice to drive prices down and equality up, then we have to make sure the way people shop for coverage on their own is better. That means reforming the Obamacare exchanges, making them less costly, encouraging more insurers to participate and allowing them to design products that people actually want to buy. We have to tackle the high costs of hospital care and prescription drugs. Hospital care is about a third of all health care spending in America, prescription drugs is about fifteen percent of health care spending in America. So those two problems alone, hospitals and drugs, that’s half of all health care spending in America. So what are the problems there? With hospitals, it’s largely that regional hospital monopolies can charge whatever they want and insurers effectively are forced to accept those prices. So we’ve got to do more on anti-trust basis and also in terms of incentivizing hospital competition instead of consolidation so that insurers can bargain with multiple hospitals in a given town or county rather than just one mega system. On the drug side we have to do more to encourage generic competition. Where generics are allowed to compete, prices are actually the lowest in America compared to the rest of the world. But where they’re not able to compete because drugs have patents that are still operating or because of artificial monopolies due to obscure policies that the Food and Drug Administration or Congress have enacted, those monopolies are where drug companies can charge higher prices. So we have to do more to encourage competition so that generics and biosimilars and other competitors can come in where there are monopolies today. It’s so much harder to make change at the federal scale, what can Florida do within its own state to improve access to health care? That’s a great question, in fact the most significant area in which states can play a meaningful role is on this problem of hospital consolidation. You don’t have to wait for the federal government to intervene with the Federal Trade Commission or the Department of Justice to launch anti-trust proceedings on your local hospital merger, the state can do that too. I actually spoke to the state legislature a few years back about that because the state was considering ways in which to tackle the problem of hospital consolidation. And so that continues to be a problem in Florida, and it’s one that the state government absolutely could tackle on its own and ought to, because the high price of hospital care in Florida is a big driver of the high cost of hospital care across the country.